A common building trend extending from the 1990’s and into the 2000’s was to create large open spaces in homes. This typically resulted in two-story open Foyers and Dens which gave a sense of spaciousness and volume. While aesthetically pleasing, two-story vaulted ceilings can represent lost opportunity. 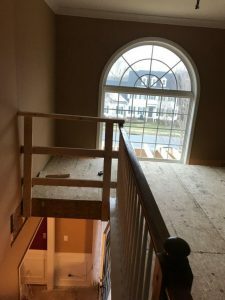 Through the years, homeowners have realized the potential space that could be created by framing in a separate floor in a two-story vaulted room. For homeowners in growing areas such as Charlotte, NC, real estate values are skyrocketing. This is due to fast population growth and limited availability of houses on the market for sale. Prospective buyers are often caught in situations where they are in a bidding war with other potential buyers and/or having to make quick decisions on whether to make an offer to purchase for a house. These market conditions create an environment where existing homeowners may try to recapture existing square footage in their house because it is the most economical option. Generally speaking, capturing additional floor space without increasing the footprint of a house will cost substantially less than the cost/square foot of buying and selling. Other homeowners may simply love the neighborhood and home and have no interest in moving, but would like to add additional square footage to their home. Structural Innovations has worked with numerous home owners to create structural framing plans to reclaim space in a vaulted room. Depending on the floor plan of the house, the re-claimed floor space can be used as an extension of a master suite, bonus room, additional bedroom or bathroom. The project can often be straight forward and involve minimal floor changes. These minimal changes, however, create maximum usability in an existing home. The photographs below were taken from a Structural Innovations’ project. The homeowners loved the house, and wanted to stay there for the foreseeable future. They, however, had a growing family and needed more space. Additionally, the husband worked primarily from home and needed more space for an office. Hence, the family decided to reclaim valuable space over their two-story vaulted Foyer. 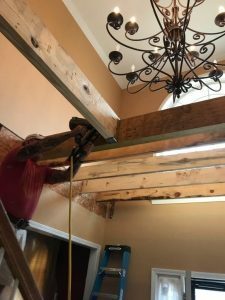 The project involved framing floor joists across the Foyer and installing several header beams around the stairs and over openings on the main level. Another benefit of the additional floor framing is that it serves to stiffen the exterior wall. Exterior walls of two-story vaulted rooms are typically balloon framed (two-story wall studs that extend from the foundation level to the roof); balloon framing will deflect more during high winds which can cause issues with leaks around doors and windows and may cause cracking in rigid veneers such as masonry or stucco. The house is supported by a crawl space foundation system; the existing piers and footings were accessible for review. Our structural engineers determined that the existing foundations were suitable for supporting the additional floor space. Once complete, the added floor space is going to be used to create a home office and extend the master bedroom closet. 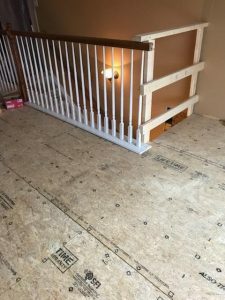 As with any project of this nature, a structural engineer should be consulted to determine the feasibility of reclaiming the floor space and ultimately designing the supplemental framing that is required. The structural engineer will need to review the existing foundations and framing to determine the extent of structural changes needed to support new floor space. Local building authorities typically require a framing plan prepared by a structural engineer that will indicate the size and type of framing to be added and how the new framing will connect to the existing structure. A foundation plan may also be required should it be determined additional foundation support is required. Structural Innovations has successfully worked with homeowners to create engineered plans that allow them to accomplish their dreams. If you have a potential renovation project, please consult our staff of experienced structural engineers.